Would You Buy Fake Dirty Jeans For $425? Just when you thought the stylish fashion trend of taking a pair of brand new perfectly good pair of jeans and ripping a hole in them and selling them for four times the regular price was stupid, Nordstrom has raised the bar by selling a pair of fake mud jeans for $425. If you are wondering what in the world are fake mud jeans, they are exactly what it sounds like: jeans covered in fake brown mud. Who would buy these jeans anyways? The obvious answer are wealthy people who have never gotten dirty in their lives because if they have, they wouldn’t need to buy a pair of fake dirty jeans to impress their peers. By spending $425, someone can now “look” like they worked hard all day without actually doing a single thing. The more things you buy, the more things own you. You will constantly have to keep working to keep up the lifestyle of owning stuff. One who starts off buying a new luxury car because of a new job with a big raise might feel like the apartment they are currently living in doesn’t fit with the image of their fancy new ride, so they move to a bigger house with a garage to park their new car in. To fill this new place, they buy new furniture and furnishings. Along with the house comes higher property taxes, landscaping, HOA fees, and new neighbors. To impress their fancypants neighbors, there will be things like new clothes, private school for their kids, and exotic vacations for the bragging rights. Before they know it, that raise isn’t so big anymore and now they are working even harder to pay for their new lifestyle. No one likes hard work, but the sense of accomplishment from seeing a project you’ve completed yourself is priceless. 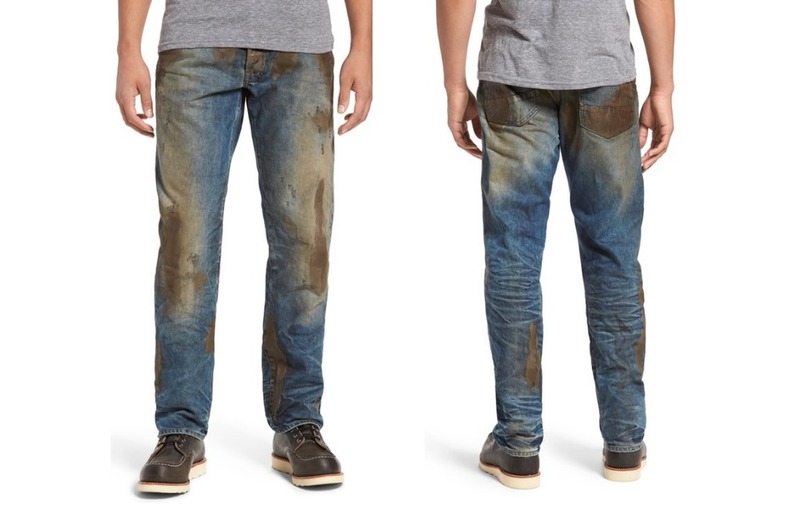 The ironic thing is while a person wearing these fake muddy jeans might think they are tough and interesting because of how manly they look, they will experience a bigger rush knowing they’ve tackled a difficult problem and solved it themselves and they now have a good story to tell which is real. Consider this. Would you feel more successful seeing a pair of jeans that is dirty because you paid for it or because it brought back memories of a challenge you took on and succeeded? This is why I prefer to pay for experiences instead of material things. Once the new item novelty wears off, the joy of owning something new is gone, but I will always cherish the memories of life’s experiences. Would you buy these jeans? What’s the most you’ve spent on a pair of jeans?